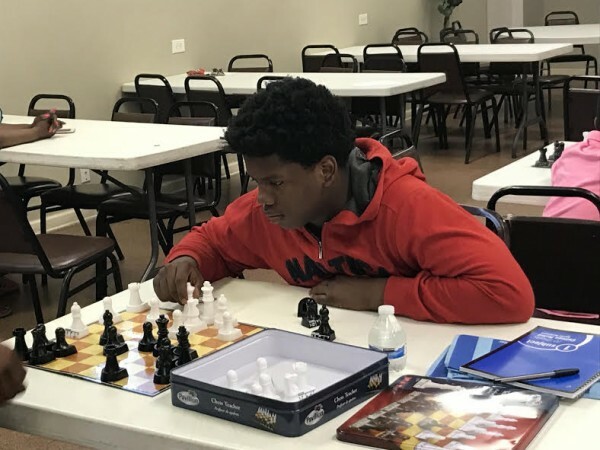 Austin teen Jaquan Weaver didn’t call himself a chess player six weeks ago. But now, the 15-year-old high school student can identify all the chess pieces and know how to move each one on the board. 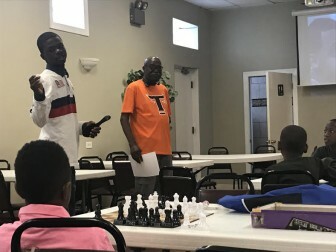 “The rook, or the castle, moves seven spaces either forward and back or across,” he said, as more than a dozen young people and their family members gathered one recent Saturday at Northwest Austin Council’s Chess Club. The chess club has been meeting every Saturday from 9 to 10:30 a.m at 5730 W. Division St. since mid-April. The club offers free training to children 8 to 16 as well as adults, with the aim of helping youth improve their communication skills and critical thinking. But the program also has a deeper intention, said Carolyn Ball, the chess club’s founder and a member of the anti-crime organization Coalition of Peace Makers. That’s what made her determined to give young people in Austin something fun but educational – and something that will make them less likely to be recruited by gangs. The chess club is open to players of all levels. Six kids came the first week back in April; now it’s expanded to 15, with five volunteers from the Peace Makers who give instructions throughout the session. Recruiting is always hard in Austin, Ball said, but it’s important to reach out to kids and give them more options no matter their backgrounds. “I walk from Central to Austin every week, giving out flyers, talking to people,” said Ball, who carries a handmade sign to promote the program. Most of the participants are neighbors from the blocks between Austin and Mason, said Allan Evans, 72, a recent volunteer. The retired special education teacher used to run a chess club at McKay Elementary School and has more than 40 years experience with the game. Although most are new to chess, Evans said the kids are doing great. 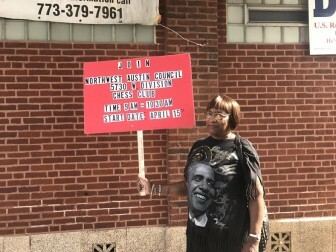 “They love the game,” the Englewood resident said. Weekly activities include demonstration and practice. Kids are encouraged to step to the front and share what they have learned over the past weeks. Then they pair up to play the game, while enjoying snacks and beverage. Practice is also important; Evans tells participants they have to play 50 games before they should say they are a chess player. One of the lessons Jaquan has learned from playing chess is to think through every move. And for younger kids, playing chess helps them be more efficient in their schoolwork. “It takes my time and keeps me concentrated,” said Willie Patterson, 12. The six-grader, who lives with his parents in Austin, said the game has helped him improve his grades. Playing on a projector one recent Saturday morning was Life of the King, The 2013 movie tells the true story of an ex-convict father who teaches one of the students at the school where he works as a janitor how to play chess. “While you are teaching them chess, you also instill in them a little spirituality and morality,” said Butch Campbell, another volunteer. “You have to look at the whole picture, analyze it. And you don’t be too hasty when making your move,” said the 72-year-old, who grew up in Austin and lives on Chicago’s South Side. The free chess program appeals not only to kids but also their parents. Charles Hunter, 47, was participating with his 9-year-old twin girls. The 15th District police officer found the flyer that Ball left at the police station. He decided to come with his daughters, both of whom study at St. Angela School. The program is important, he said, because it keeps young people off the streets. He said one reason youth end up on the streets is that most Austin schools’ extracurricular activities end by 5:30 p.m., and many have reduced after-school programs. Linda Johnson, 63, who’s lived in Austin for more than 30 years, brought her grandson Marlik Caston after the 15-year-old finished a weekend program at Lincoln Park High School. 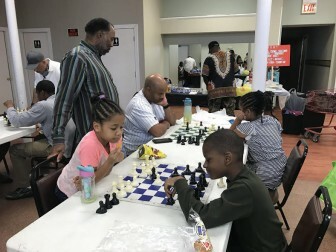 “When we expose our kids to something productive, their minds are less likely given to violence and crime,” the retired social worker said, adding she plans to volunteer at the chess club and bring her 8-year-old grandson. But it takes lot of work and patience, she added. Campbell said the next step is to extend the chess program to Christ Lutheran School. They’re also working to organize other activities for Austin youth at the new location.